We have been climbing the heights of DIY in our kitchen of late, let’s face it, with weather like this what else is there to do? Tim has put in a beautiful sink that we found last year that has been sitting in our garden ever since, we have plastered the ceiling with a little help from some friends, painted and have gutted the chimney. There is still a bit to do to finish, but still, I plunged ahead and added some “finishing touches” today. If it wasn’t for some of these recent charity shop trinkets shedding their light upon my sill I think this Rainy Sunday, on top of 27 other rainy days, would have driven us round the bend. 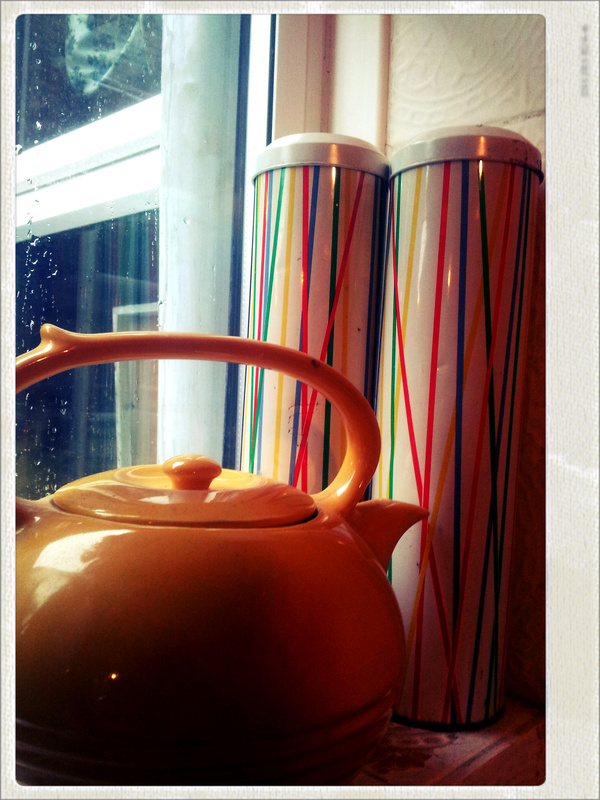 Last week on the Walworth Road I found these tall tins for 75p each. What a DELIGHT they are!! Check out the funny little tea pot, from a car boot, with his two spouts. “I’m a little teapot short and stout, here is my spout and here is my other spout” He actually sounds like me trying to sing the songs at playgroup – those words! They ALLUDE me! But I can’t NOT join in, can I?! I probably don’t have to sing the wrong words quite so loudly, but I inherited that from the afore mentioned mum. And, last, but by no means least, in the same Bedford haul, I found this. YES! It is EXACTLY what you think it is! A dead pheasant oven mitt! It even has his beautiful little head curled into his shoulder like he is ready to be plucked. Cute, innit! Hope you have found some ways to get a little sunshine in your life recently. Linking up with Liz and the Magpie Mondays! Go and have a gander at their beautiful treasures. PS – I am so very sorry about the horrendous photos – taking pictures in this grey, cloudy world is a challenge that defeated me. 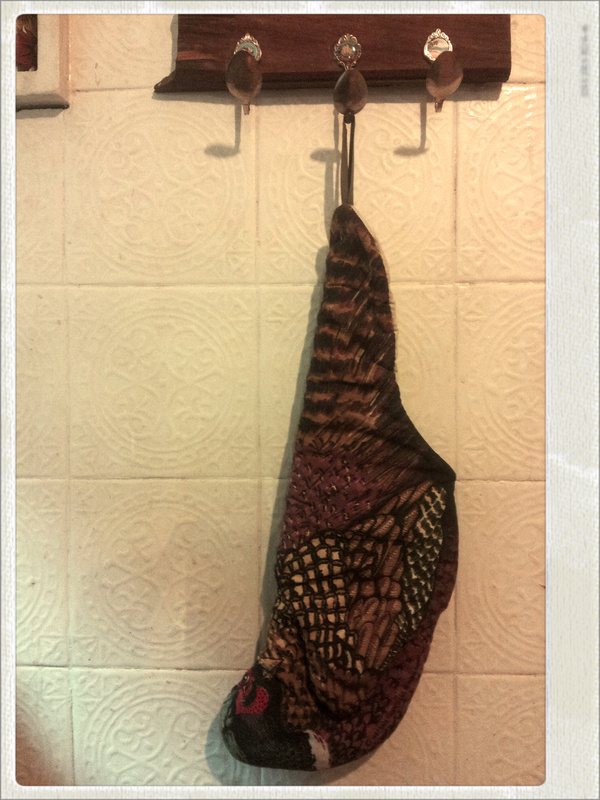 Posted in Finding things, Thrifty and tagged charity shop, magpie monday, pheasant oven mitt, retro blind, thrift. Bookmark the permalink. I genuinely LOVE that dead pheasant oven mit! Isn’t he just the LUSHEST THING! I am LOVING that dead pheasant too. We always need lots of oven gloves due to cooking on The Beast (I have the scars to prove it) and I want a dead pheasant. Don’t think I will find one easily though! Do you think there were any other dead creature oven mitts in their range? ?if not there’s a niche for someone to exploit!! Totally! Worth investigating isn’t it? Actually, I’ll let you in on a secret. There was another one in the shop. The sallies shop in Bedford, by the bus station. A steal at £1. I didn’t feel the need for two left handers. that oven mitt is the best thing EVER. I KNOW!!!! I almost died with joy when I saw it. I really like the blind made out of a table cloth! Not sure about the pheasant though…. Hehehe, thank you! I am glad you are here to balance out the dead pheasant oven mitt enthusiasm! I cannot believe you raided my chazza shops without inviting me – the cheek! I so would have fought you for the clock and dead pheasant though. Hehe, I know, totally mislaid the charity shop territorial etiquette rules there! Who could have imagined an orange tree would have been the perfect goody bag item last week eh? Hahaha – my parents would LOVE the dead pheasant oven mitt, I must look out for one. They used to have one which looked like a penguin, known as Mr Flibble (Red Dwarf). 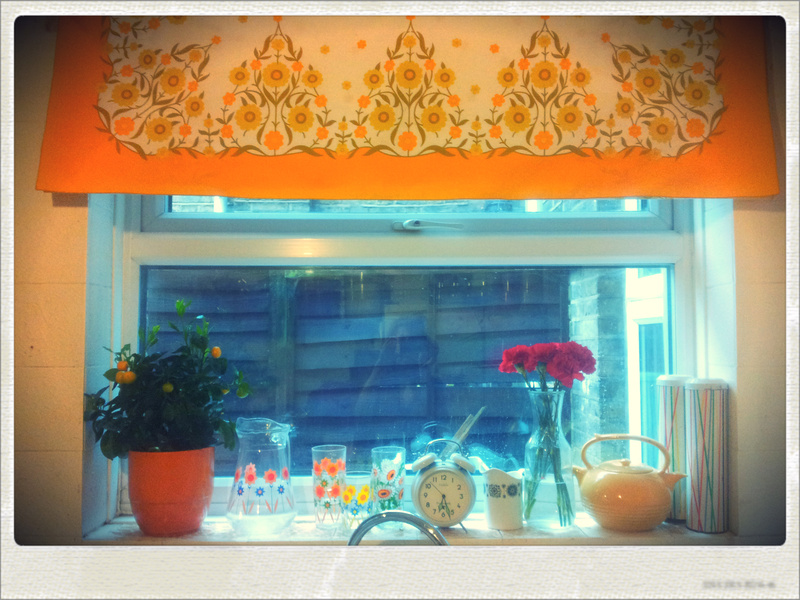 Also liking the new and incredibly complicated blind 😉 I have loads of orange in my kitchen, including the giant 70s breadbin I bought and still haven’t put anything in! A giant orange bread bin from the seventies? JEALOUS!!!!!! The blind is just glorious! 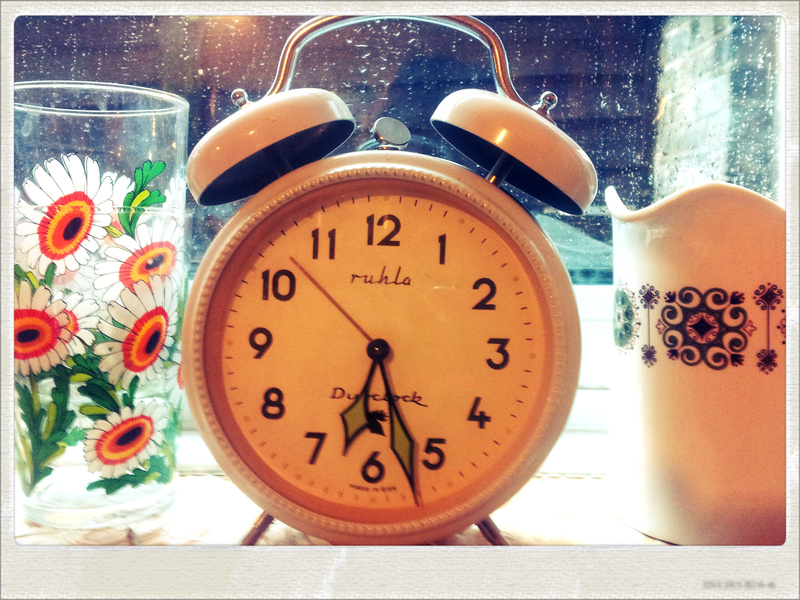 You really made me smile with the clock observation, I swear I have no clocks that work, unless I really need them too! I’m glad I wasn’t the only one having problem taking photographs…its been so hard! Thanks, it’s a beauty isn’t it. Ugh, taking photos without any natural light is SUCH a struggle. HURRAH FOR SUN TODAY! love the blind and the gorgeous display on the sill, looks like a framed still life (sort of). As for the dead pheasant, that is just wrong ! wrong I tell ya ! Heheeeee!!!! Love how people are divided so strictly in half, lovers or haters! Love that blind! Its fab! Thanks, me too. My mum is the ultimate magpie! The blind, ohhh the blind! It is perfection! Kudos! 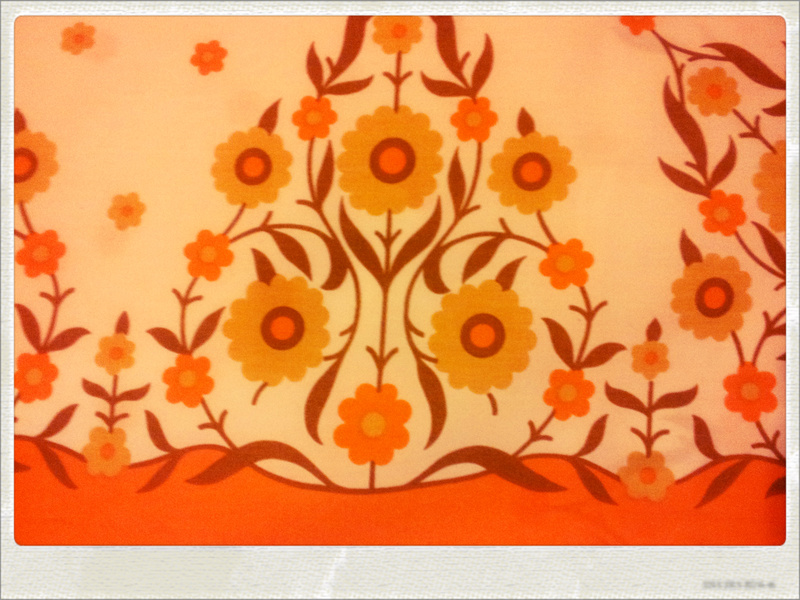 Hehehehe, Love a good retro blind, hey?! AH yes they are SO good. Very typical Old Lady Bric o Brac to raid! I thank you. Think it is Lovers of Pheasant 6, Haters 5 so far! Thanks, I take full credit for that clock. Twas in Miss Liz’s hometown of Bedford. Road trip! Your blind is such a winner! Gorgeous and so clever. The dead pheasant oven glove…I’m not sure…but looks like it belongs on that hook ! I love that blind so much. I’ve been looking for something similar in red for ages. I’m afraid we quite often have real dead pheasants hanging in the pantry!